Sometimes politicians seem to have a strange perspective on the world. You would never see that in Australia, where for some reason it seems that you want to be the underdog. In the US, people want to back a winner. It may be that those pundits were talking up the Republican's chances - I suppose another 4 years out of the White House was a little scarier than being made fun of by the LameStream Media in the weeks following the election. In Australia, we seem to have been plagued recently by politicians talking about what "the man on the street" is telling them. Joe Hockey has been especially guilty of this - suggesting that because 10 people in the street came up to him yesterday and complained about Gillard that the "people have had enough". Maybe it's just a lazy argument that politicians make up when it's just to much effort to try and talk "facts". In my view, it is symptomatic of politicians who don't seem to have any idea what the voters actually want. The unpredictability of the media is partly to blame for that. One can just imagine politicians announcing a new policy quivering in their boots at the thought that a negative story on the front page of the Daily Terror could bury it in an instant. True is it that "Sussex St" has come in for plenty of stick over the last decade. With the cloud cast by the Obeid ICAC inquiry hanging over NSW Labor, one can understand a willingness to look elsewhere for lodgings. The problem that Dastyarti plainly fails to recognize is that no one could care less where NSW Labor has its headquarters. If you actually know where Sussex St is and who is holed up there, I think it is safe to assume that moving the headquarters is exactly the kind of BS that you are going to see right through. 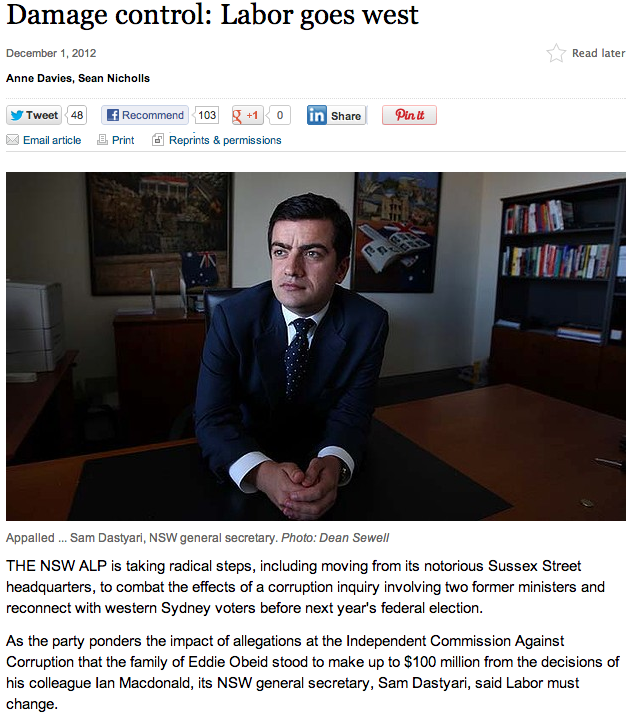 Now, maybe Dastyari is trying to spin a positive story out the media's fascination with the Obeid Inquiry, much like we saw with the nauseating "Real Julia". What I think is more likely is that people in Sussex St have heard so many barbs about the location of their headquarters that someone had the brilliant idea to move.